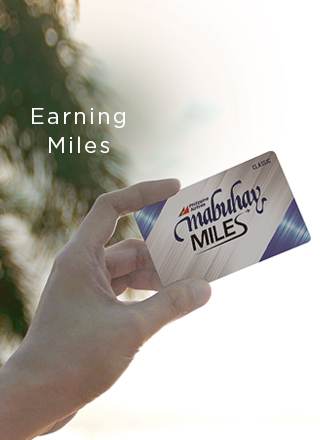 Buy Miles is a feature of earning Miles designed for the immediate use of the Member. It can be availed to add Miles to one’s personal account (Mabuhay Top-Up Miles) or the account of another Member (Mabuhay Gift Miles). A maximum of 150,000* Miles may be credited to any single account within a calendar year. Purchased Miles do not add to the qualification of Elite-tier status. A Member can purchase a minimum of 1,000 Miles for a fee or at a fixed number of Miles as provided in the Mabuhay Miles Table of Fees. A processing fee and taxes per transaction, where applicable, shall be for the account of the Member. The Buy Miles transaction shall be final, cannot be reversed and any Fees paid shall be non-refundable. Visit a PAL Ticket Office or call our Reservations for your Buy Miles Transaction. Miles Transfer is a feature of earning Miles designed for the immediate use of another Member. It can be availed to transfer Miles from one’s active account to the active account of another Member. The transferred Miles shall be added to another Member’s account and should be used for immediate redemption. Maximum of 150,000* Miles may be transferred or received by any single account within a calendar year. Member can transfer a minimum of 1,000 Miles for a fee or at a fixed number of Miles as provided in the Mabuhay Miles Table of Fees. A processing fee and taxes per transaction, where applicable, shall be for the account of the Member. Transferred Miles do not add to the qualification of Elite-Tier status. The Miles Transfer transaction shall be final, cannot be reversed and any Fees paid shall be non-refundable. Visit a PAL Ticket Office or call our Reservations for your Miles Transfer Transaction. Reinstatement of Expired Miles is a feature of earning Miles designed to allow Members to reactivate their expired Miles within a particular period to be used for redemption. Member may request to reinstate the expired Miles no later than the end of the year following the year when the Miles expired. Example A: if Miles expired on June 30, 2016, reinstatement should be made no later than December 31, 2017. Reinstated Miles once expired shall no longer be eligible for another reinstatement. Reinstated Miles do not add to the qualification of Elite-Tier Status. Visit a PAL Ticket Office for this transaction.